Here we go: New year, new video! Check out my all-new effort for Horror Express off the Pre-Cert album on Cineploit. The 1972 British/Spanish co-production starring Christopher Lee and Peter Cushing is a personal fave and is actually based on the same sci-fi novel as John Carpenter's The Thing (John W. Campbell's Who Goes There?). The movie is in the public domain, meaning you can download it for free via Archive.org etc., so make sure to check it out! Got some additional news since my last post. 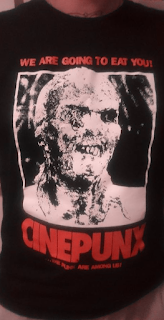 First off, check out this cool t-shirt I got from Cinepunx! A tribute to Lucio Fulci's 1979 video nasty classic Zombie Flesh-Eaters (known in the U.S. simply as Zombie or Zombie 2), you can get yours via their official Facebook page here, and make sure to tell them I sent ya! Towards the end of December I received the exciting news that my Pre-Cert album had placed at number 75 on German distributor HHV's Top 100 film and soundtrack albums, and the latest news is that it has climbed up to number 60! Just amazing. Vielen dank Deutschland! EDIT: I was just informed that the album jumped up to #59! Again, vielen dank! For those in the U.S. looking to score physical copies of either Pre-Cert or Camp Blood, Dusty Groove have them in stock, ready to ship out! Summing up my Cineploit debut as "cool 80s sound that really feels like the music from some straight-to-video flick", you can get the LP here, the CD here, the LP/CD combo here, and the Camp Blood EP here. EDIT II: I was just informed that the Camp Blood EP has sold out! Insane! Keep ordering and they'll restock it! For those in Europe, One Way Static have both records back in stock but they are already running low, so make sure to act fast on that one. You'll find Pre-Cert here and Camp Blood here. Labels: Christopher Lee, Cineploit, Dusty Groove, HHV, Horror Express, John Carpenter's The Thing, Lucio Fulci, One Way Static, Peter Cushing, Pre-Cert, Who Goes There?